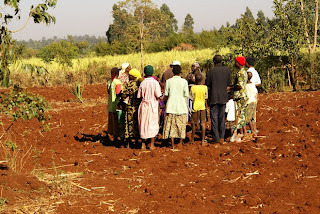 I often write and speak about the awful oxymoron, “Hungry Farmers.” How can the smallholder farmers of Africa suffer through an annual hunger season when every morning they rise with one task: grow food for their families? That these farmers should battle chronic hunger and malnutrition is absurd, obscene and shameful. But there’s another awful oxymoron that deserves our attention, particularly as we near Thanksgiving and our season of feasts. Hungry Americans. How can anyone in this richest country on the planet, home of the mightiest farmers, breadbasket of the world, be hungry? That millions of households here are deemed “food insecure” – unable, at some point in the year, to afford the next meal – is equally absurd, obscene and shameful. Hunger at home and abroad are of the same cloth. Yes, the depth of the hunger and malnutrition that I have seen in parts of Africa and elsewhere in the developing world is profoundly deeper than I have seen here. Thanks to a sturdy social safety net, no one starves to death here, as far too many people do every day in the poorer precincts of the world. But whether in Africa or America, I see the same pain, desperation, guilt and humiliation in the eyes of mothers and fathers. How will I feed my family? Where will the next meal come from? And the same longing and despair in the eyes of the children. I think back to one of my first conversations with Leonida Wanyama, who is among the smallholder farmers in western Kenya profiled in my new book, The Last Hunger Season. With head bowed and voice low, Leonida told me of the bleak Christmas holiday that had just passed; all she was able to offer her family was a pot of boiled bananas. Now, in the U.S., I’m reminded of the many food pantries preparing to distribute turkeys and all the fixings to families who otherwise wouldn’t share in our great Thanksgiving tradition, and I think of the many soup kitchens readying meals for those who have no place to eat such a feast. In both Africa and America, I have seen hunger narrow the choices of daily living. For the smallholder farmers with their meager crop yields: feed my family or sell some of my harvest to pay school fees for my children; feed my family or buy malaria medication; feed my family or repair the hole in my thatched roof. For those who rely on American food banks and soup kitchens: buy food or pay the rent; buy food or keep my health insurance; buy food or pay the electricity and gas bills. Hunger, no matter where it is, is an abomination. It tears at families, communities, societies. It cheats economic development. It haunts the conscience. Or at least it should. In Africa, severely malnourished children clinging to life in emergency feeding tents. Families struggling to make it through the day on a mere cup of tea. In America, astonished teachers watching students stuffing their pockets with food at Friday lunch, even when that food was spaghetti, because they didn’t know if there would be much to eat at home over the weekend. Children so eager to get to school they hopped off the buses on Monday morning and raced through the hallways; they were heading to the cafeteria, for school breakfast, because they hadn’t eaten much since school lunch on Friday. A common source of hunger, of course, is poverty. For Africa’s smallholder farmers, it is an absence of essential resources: better quality seeds, micro-doses of fertilizer, financing and agriculture extension advice – the vital ingredients to grow enough food to feed a family for a year. For families in America, it is an absence of a living wage, a lack of decent paying jobs to afford food security throughout the year. The solutions are also similar. They must be long-term, beyond the immediate aid, and include more community input, individual empowerment and innovative education. The goal is for the farmers of Africa to grow as much nutritionally rich food as they possibly can and for the food insecure in America to be as productive as possible and earn enough to buy their own food. One more common thread: Efforts to end hunger are under siege by the global financial mess. In the U.S., both short-term safety nets and long-term solutions are threatened by budget cuts, be they food stamps or women and infant care programs or the White House’s Feed the Future initiative which focuses on improving harvests of smallholder farmers in the developing world. The mandatory spending cuts that loom at the fiscal cliff will have a disproportionate heavy impact on poverty and hunger programs, which have already been hit in previous budget slashing moves. Hungry farmers? Hungry Americans? The awful oxymoron would be extended, not ended, by such cuts. At Thanksgiving, we know we can do better. It is the time to commit to the last hunger season.